The past is a mystery to the protagonist of EPIC KILL, a new comic book series by Raffaele Ienco due out from Image Comics in May. Eighteen-year-old Song is an assassin. She just doesn’t know it. In her life at the St. Thomas School for Troubled Girls, hints of her past slip into her daily life - a tea cup caught before it can shatter on the floor, memories of sparring sessions, and, finally, her ultimate skill put to use once more. Song must fight her way through scores of men trying to kill her to find the man who sent them, and perhaps solve the mystery of who she is - and why she is one of the deadliest weapons in the United States. Ienco, whose previous work includes the horror comic DEVOID OF LIFE, also published by Image, promises to deliver on the title of his comic, with Song performing at least one epic kill in every issue. EPIC KILL #1 (MAR120415), a 32-page full-color action comic book for $2.99, will be on sale in stores and digital platforms on May 2 and is available for order in the March issue of Previews. 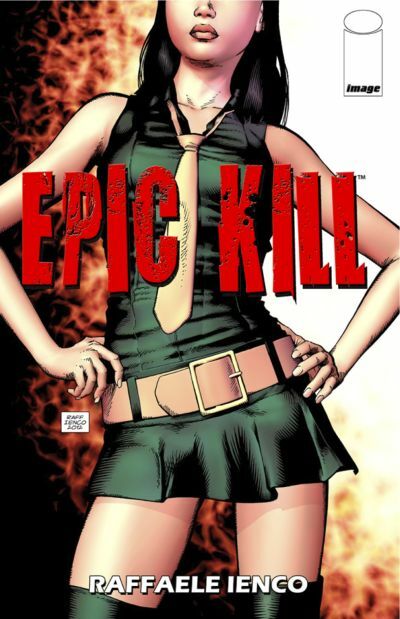 An exclusive preview of EPIC KILL #1 was featured at USA Today on February 15.